Are you looking for luxury RI water view property? Rhode Island offers an outstanding assortment of ocean view homes in towns such as Newport, Little Compton, Westerly, Jamestown, South Kingston, North Kingston, Portsmouth, and Narragansett. 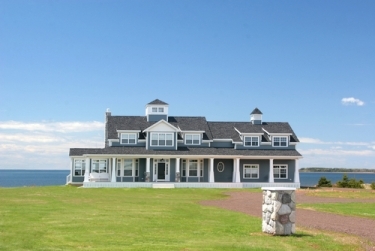 You'll find homes on sandy peninsulas, homes on farmland with sweeping ocean views, dramatic homes perched high above the Atlantic coast on rock cliffs, and oceanview vineyards. Scroll down to view Rhode Island luxury water view homes, or read more about amazing water view properties along Rhode Island's coast. Do you dream of owning a home on property that seems to be on top of the world with water views that slip into the horizon? Discover for youself, Rhode Island's most beautiful water view homes and land. Many mansions that are both water view and waterfront, can be seen along Newport's famous Cliff Walk - a well known, popular walk along the eastern shore of Newport. Cliff Walk is a paved path that is a public right-of-way over private property. An important consideration when deciding between water view and waterfront homes, is the fact that in general, water view homes, although just as luxurious and often more private, are generally priced substantially below waterfront homes. Contact Hogan Associates for more information and to view Rhode Island's finest water view homes (401) 680-6588.